If you’re hosting an event outdoors and don’t want to worry about the weather, your best choice is to set up a tent. Keep your guests cool in the summer or insulated from the cold winter weather. 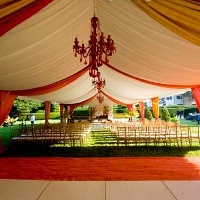 Our directory lists quality and trusted services that provide tent rentals in New York for all types of events. Check out our friends at KidsParties.Party for even more party tent rentals in NY. 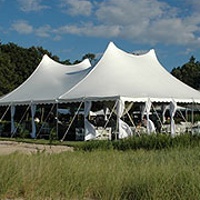 Your One-Stop Source for Tent Rentals NY! When you need a tent for an event you can count on Ace Party & Tent Rental to have what you need. Frame tents, marquees, clearspan structure tents, pole and tension tents in all sizes are available for rent. Whether you want a tent with walls for easier climate control or an open sided tent for a garden wedding, Ace can accommodate you. Modifications can be added to many tents such as doors, liners, tent flooring and heating and cooling options - whatever you need to make your event comfortable! In addition to their huge selection of tents, Ace also rents staging, lighting, power supplies and many other portable options for parties and events. 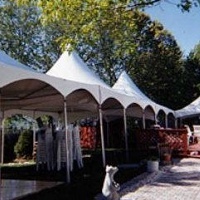 The New York Tent Company Inc.
For over 16 years this family owned and operated tent rental company has served the Long Island area with tent rentals and accessories. Offering great quality tents in a variety of styles, The New York Tent Company is sure to be able to meet your needs no matter what type of event you are having. High peak tents, frame tents, pole tents, lighting, heating and flooring for tents and much more can be rented from this exceptional company. Boasting the cleanest tents in the industry, The New York Tent Company will accommodate events both big and small. When it comes to holding outdoor events, you don't want to have to worry about cancelling because of rain. 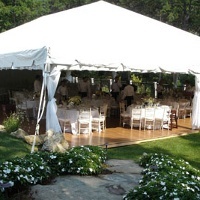 To rid yourself of weather worries, rent a tent from AAA Party Rentals on Long Island! They offer many types of tents in all sizes to accommodate a guest from 10 people all the way up to the hundreds. 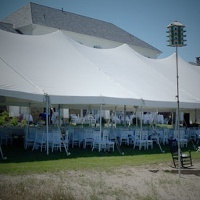 Serving the Long Island area for over 35 years, this company has lots of experience in outdoor event rentals. From tent heating, to tables and linens, you can rent everything you need for a great party from this New York tent rentals company. A Dozen Types of NY Party Tent Rentals! 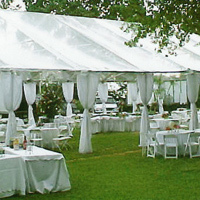 For over 25 years this party rental company has been providing high quality tent rentals to New York. With a huge range of sizes to accommodate any party or event size, and a dozen different tent types, you are sure to find tents that will be just right for your wedding, outdoor birthday party, picnic or other event. 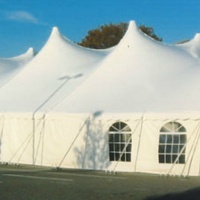 Choose from marquees, canopies, frame tents, high peak tents and much more. In addition tents, Cabaret also rents dance floors, bars, tables and chairs, linens, concession machines and everything else you could need to make an outdoor party complete. Use Cabaret as your one-stop party rental shop! From Tents to Stanchions, Partopia Has All! 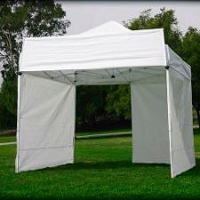 Partopia Rental offers frame and canopy tents in several sizes which are great for small parties, picnics and fairs. Give your guests a place to retreat from the sunlight or spring mist when you have a tent at your outdoor event. Partopia can offer you all the accessories you need for your party including tables and chairs, linens, audio equipment and more! This party rental company has been serving the five boroughs for 7 years and strives to be accommodating to all clients. Visit their showroom to see the many party rentals they offer. 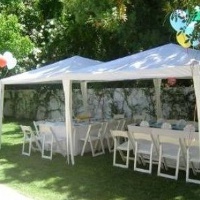 A-1 Party & Tent Rentals is a one-stop party rental company offering NY tent rentals for your event. 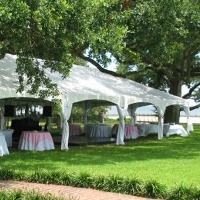 They have frame tents in sizes as small as 10x10 feet all the way up to 40x100 feet so that no matter the size of your party, your guests will be able to stand in the shade or retreat from unexpected rain. A-1 is a full service rental company and offers chairs and tables, silverware, glassware, dinner ware, food and beverage accessories and more. Table linens and chair covers come in a wide range of colors to match your party theme or wedding colors. One-Stop Party Tent Rental Source! 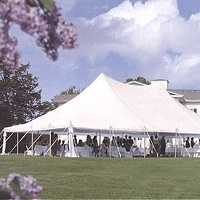 This great party tent rental NY company can help you make your outdoor party an event to remember. Not only do they offer a huge range of sizes and styles of tents but they can also do custom tent sizes so that no matter what your event type, your guests will comfortably fit. If you'd like an outdoor event in the colder months simply ask about their heated tent options - don't let the season or weather spoil your dreams for an outdoor event! In addition to being able to provide tents for all types of terrain, Atlas offers linens, cooking equipment, flatware, glass and dinnerware, dance floors and more. Table linens and napkins in over 40 colors so you can match your party or wedding colors. Great for Outdoor Parties Year Round! This source for tent rentals in NY can offer many types and sizes of tents - so whether your party is a small private event with 20 people or a large wedding with hundreds of guests, there's a tent here for you. All Queens Tent & Party Rentals come with the option for side walls, so if the weather is a little cool or there's a possibility of rain you don't have to fret. If you'd like your tent heated and lighted, Queens Tent & Party Rental can also do that! In addition to tents, this party rental company can complete your party needs by providing linens, lighting, tables and chairs, dance floors and more! Ask about their rental packages. This party rental company has a truly gigantic selection of tents for you to choose from for your event. Since they are a full service party company they can help you to choose tent liners and draping to beautifully decorate your tent. Check out their online portfolio for examples of their work. Call to talk to a party planner who can help you decide what size and type of tent is best for your event whether it's a private party, a wedding, a film premier in the city or any other type of event. This company prides itself of offering one-of-a-kind events and top-quality merchandise. 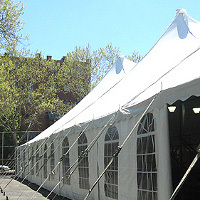 With tents that can seat as few as 9 people or as many as 300 people, Brooklyn Party Rental has your event covered. Make sure you don't have to worry about the weather for your outdoor event by using a company that offers tent rentals in New York. Brooklyn Party Rental can also offer you the rental of food service equipment such as chafing dishes and food warmers, the rental of carnival supplies such as fog machines, hot dog griddles and more, and the rental of tables and chairs. Take the stress out of party planning when you use this great company. Tent Rental near the Thousand Islands! Looking for tents for your next party? 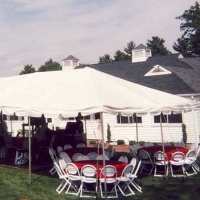 Choose Party Rentals, an Upstate NY company that can provide you with a variety of tent options. From sturdy frame tents to elegant elite tents with dramatic high peaks, you can find tents in every size. From bar/bat mitzvahs to clam bakes, tents are great for outdoor parties when you need to give your guests a place out of the sun. This great party rental company also has a spacious showroom, so you can view their products before you book them for your event. Check out their other rentals such as tables and chairs, linens, flooring, dinnerware and much more! If you need a tent for your event, you'll find West Side Party Rental to be a great choice. With a large inventory of tents in all sizes they are sure to have what you need. 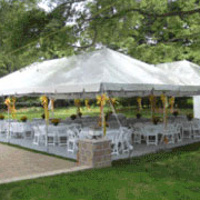 If you need an unusual size or have a very large event, West Side is happy to do custom tents to accommodate your event. In addition to tents, West Side Party Rental also has a wide range of dinner and flatware, table and chair coverings, tables and chairs, coffee services, buffet service and much more party equipment available for rent. You don't have to waste your precious time searching around, West Side has it all in one place! Many Types of Tents to Choose From! Catering to weddings, corporate events and family parties, Ann's Party Rentals has tents that are appropriate for events from casual to fancy. With over 30 years experience in the industry, the professionals at Ann's Party Rentals can work with you to transform your event space into exactly what you desire. Elegant pole tents are beautiful for outdoor weddings, while sturdy frame tents make barbecues and clam bakes a cooler place. Ask about other event add-ons and rentals such as dance floors, concession equipment, table and chair rentals and much more. Veteran Owned Party Tent Rentals New York! For tents of all types you'll want to visit Spatola's Party Rental. They have been providing their tents for conventions, weddings, small parties and other events for several years and can help your event to be a success. Visit their website for helpful tent layout suggestions and a tent size calculator to figure out what size would be best for your party. In addition to tents, Spatola's also offers the rental of tables, chairs, chocolate fountains, dance floors, table settings, chandeliers and much more. One of the Top NY Tent Rentals Companies! When it comes to throwing an outdoor event, you don't want to have to worry about the weather. So rent tents from Classic Part Rentals and eliminate that worry! 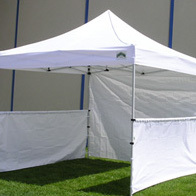 Tents are great to give your guests shade on a sunny day or shelter from a spring mist. 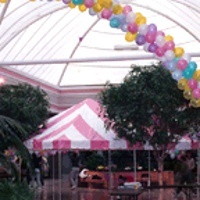 These party specialists offer tents in all shapes and sizes to accommodate any size party. If you need to provide items for your whole event, you'll find Classic Party Rentals is the company for you - offering everything you could possibly need to furnish an outdoor party from china and chairs to platters and partitions. Classic Party Rentals is your one-stop source for party rental equipment. Tents and Decor for Your Outdoor Party! Tents are a great way to have a party outdoors without giving up the comfort of an indoor space. Abbott Party Rental carries tents from 10x10 feet all the way up to 100x40 feet so they can accommodate parties of every size. When you have your party in a tent you won't have to worry about the weather - dance floors, heaters, and sidewalls for tents help keep your guests at a good temperature no matter what the weather decides to do. In addition to tents, you can rent several sizes and styles of tables and chairs, many colors of linens and chair covers, tons of catering supplies and much more to make your party complete.